We contacted Rob Lion as part of our mission to document some of the exciting emerging shapers who are pushing themselves in terms of materials and design. Rob’s work is insane. He does everything from design, to making his own EPS blanks, to shaping and glassing and even colour work. Although he’s been shaping for a relatively short time his work is refined and respected.Â His shaping lineage has deep roots in California and Brazil. He currently lives in the UK and is steadily putting out amazing work.Â What’s exciting about people like Rob, who has mastered the entire board building process, is that he’s instrumental in keeping that craft alive. Enjoy. How long have you been shaping and where do you work out of? 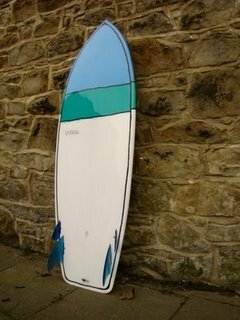 I started shaping at the end of 2003, just making boards for friends, in a shed in the Bahamas. I had just moved back there after living in the US for 20 years, and in California for the last 8. In 2004 I moved to Brazil to work in a factory in Florianopolis. In 2006 I moved to Newcastle, UK, and have been working out of a small shop in the back of my house pretty steadily since. Who did you learn/apprentice with and how has that influenced your work? The last year I was in California, I was lucky enough to get a job in the Channin Fiberglas/Surfboards shop in Encinitas. It was a dream come true, and I am utterly grateful that they took a total rookie in. This was when Rich Pavel was renting space there, along with a stable of great people like Jim Phillips, Hank Byzak, and Steve Clark with the Eberly and Bahne shops next door. They were doing boards for all sorts of legendary people, Yater, Eaton, Joel Tudor, Rainbow, Choice, and some others I can’t remember now. I was just hot coating and doing fin boxes at the time, but I used to have time to watch these guys work, ask questions, and check out all sorts of boards. The funny thing is, at that time I was stubbornly riding longboards only, and despite working with Pavel, never rode a fish until 3 months before I left…. now it’s my favourite platform, duh. When I moved to Brazil I was lucky again to get in with a somewhat underground guy there named Mauro Roxo at CCL who was sponsoring a few hotshots, and hosted quite a few foreign shapers, like Bruce McKee. Working with Mauro was great because he was more into performance shortboards and was always pushing me to tune my rails more, and to look at every board with an eye to performance. Because we had to speak in broken English and Portuguese there was no room for fluff, which was refreshing. He also introduced me to McKee’s multi-system, and encouraged experimentation with fins, so again I’m very grateful. I also met a shaper there named simply Paulinho who runs Enderoy. He gave me my first EPS blank, and sold me the epoxy at cost for my first attempt with the stuff. He was very gracious with the sharing of information, showed me how to make a hotwire bow, and let me in on his high tech Kevlar/carbon sandwiches as well as some vacuum bagged wood/foam and other experimental foams. He was like a mad scientist, at only five foot tall, and wired on coffee. I became friends with Jeff Lopes there as well, who shapes for Spider, and still competes. He was also very gracious, and we had many good times talking about boards, and surfing together. After moving to the UK, I have attended both Fish Fry’s and spent some time in the shaping bay with Alex from Barrel from France, and Paulo Jacinto in Portugal. Both are impeccable craftsmen, and deserve more attention than they get. It wasn’t until after this that I felt everything came together for me. They just broke things down into simple terms, and gave honest feedback on my shapes. I still keep in touch with them, and am very grateful for all the help they’ve given. Do you have a specific design that you prefer or excel at? After being so resistant to the fish platform, once I rode one I was hooked. Since then, I have been tweaking and adjusting my templates to where I am happy today. I prefer a semi-traditional fish – in the sense of rocker and foil – with modern rails, and slightly pulled in template. I have been making rocket style fish for the past year, and have gotten very positive feedback. There is still so much you can do with this design. I’m also working on longboards a lot lately, and am stoked on them again. The boards I like are again semi-traditional, with heavy glass jobs, and 50/50 rails, but a bit more foiled with a modern twist. Do you or have you used alternative material such as Biofoam or EPS? I have just gotten my first Biofoam blank from Homeblown to make something for the next Euro Fish Fry, but use EPS/epoxy for my own boards all the time. I try to get more people on them because while they may still come from the same oil well, they last much longer, and that has to be a good thing. I’m experimenting with my 1st wood/foam compsand (composite sandwich), and am also planning out a chambered board made from recycled timber. The majority of my boards are made from Homeblown blanks though as most people want traditional Pu/Pe boards. Let’s face it, oil fields are going to dry up sooner rather than later, and oil prices are going to skyrocket. So, if for no other reason, it makes sense to move away from plastics and other oil based products. The problem for me is convincing people to spend their hard earned money on what to them, seems like a gamble. What do you think about the current state of handcrafted surfboards? I’m not really sure what is going to happen. At the moment, things aren’t looking good for local firms that are more production oriented. By that I mean shops that produce stock boards, compete with large brands, or imports, and have several employees. Here in the UK, we are about five years behind the US in terms of economics, and fashions. We are just now experiencing the flood of cheap pop-out style boards. There was a grassroots rebellion starting, but has died out due to very few board makers joining in. The small guys that are doing more custom stuff only seem to be steady, but for how long? Most people at the beach are more worried about the state of global economics than where their board comes from at the moment. Again, that’s a tough one. I would like to think I could grow a little, and either employ someone, or maybe get involved with training an apprentice to take over the world… No really, I’ve just been talking to one of my friends above, and he’s just bought a big warehouse with his glasser and they’re going for it. I’m stoked for them, but I’m not sure if that’s where I want to be. It may be inevitable, but I’d like to stay small, with maybe just one or two others, and just make beautiful boards and be free to experiment. It is a business in the end, but I recently re-read an interview with Malcolm Campbell, and was really moved by his comments on shaping and the state of surfing. He’s never faltered in his belief system, that it should be done “for love, never money.” While I know I have to sell boards to make a living, the underlying sentiment is what inspires me. What do you love about being a surfboard shaper/designer? It sounds corny, but it is really cool to paddle out on something you’ve made from scratch. It may be a total dog, but the satisfaction of getting it right, or just having a new experience is priceless. I went to college for sculpture, so in some way this satisfies that need to create as well. In the end, it’s just about you and your board out in nature enjoying life and being submersed in the ocean. If I can be a part of that, and get a smile, I’m stoked. Great interview! Rob Lion really embodies the beauty and artistry of surfing in his boards. It’s inspiring to see such a talented guy find success doing what he clearly loves. It’s incredible how soul shapers share almost the same feelings in relation to their work and their creatures, doesn’t matter in which part of the globe they live. Congrats Rob for this great interview! It is indeed truly amazing that no matter where soul shapers live they all say the same thing, ride the same thing,and drop the same names. . . almost as if they came out of the same soul mould ! Good to see a really nice, helpful bloke getting some space. Keep up the good work fella. Thank you everyone for you kind words, and support. Also thanks to Phoresia for supporting the custom surfboard industry by doing these interviews. One of my favorite shapers. shapes are great and I still have not seen better artistry than on Robs boards. I’m really happy that he is taking it to the next level. We see a lot shapers come and go over the years. It is my position that the years are meant to be kind to Rob, as he has been very kind for years. From this interview it does not leave much to ones imagination that Rob Lion of Royal has his hands attached to his heart and mind and that all three are being refined. Keep trusting the process Mr. Lion. You are well on your way. Thank you for being a friend.